Most caregivers assume their role with little or no help from family members and friends, and it could take a toll on their own wellbeing. However, with respite care, taking care of an elderly parent doesn’t have to be too stressful. Here are a few benefits of hiring a respite caregiver. Family caregivers often have difficulty differentiating between their own personal lives and the lives of their elderly loved ones. When you’re constantly referring to your loved one’s medical condition as “our health issues,” it’s best to take a break. You do not have to give up on caregiving, but you need to find a balance. With respite care, you can get the downtime you need without compromising the quality of your loved one’s care. When considering home care, Richardson, TX, families should make sure their senior loved ones have the resources they need to maintain their independence and remain healthy. Trusted in-home care professionals can assist seniors with daily tasks like cooking, bathing, and exercise, and they can also encourage them to focus on healthier lifestyle habits. Caregivers often have to split their time between caregiving, professional commitments, and their spouse and children, which makes it difficult to focus on self-care. However, with respite care, family caregivers have more time to work out at the gym, go to the spa, catch up on rest, and pursue other relaxing activities. Continuously caring for an elderly loved one can affect the mental health of a family caregiver. You may take on more than you can handle and forego a social life. Respite care is a good option for caregivers who want to boost their overall health, uplift their mood, and bring a sense of calm to their lives. Families who need help caring for a senior loved one can turn to Home Care Assistance, a leading provider of Richardson elderly care. Services available in our customizable care plans include meal prep, mental and social stimulation, assistance with personal hygiene tasks, and much more. Apart from relieving you of your caregiving duties, a respite caregiver can also provide tips on simplifying your role going forward. You’ve likely taken on the caregiver role with little or no training, and you’re probably learning as you go. You can ask a respite caregiver for some tips on how to enhance your loved one’s health and prevent burnout. Going on vacation with family members and friends, catching up on personal goals, and participating in community activities is easier for family caregivers who have extended time off. It may be difficult to take time away from caregiving if your siblings and other family members fail to step in and help. With respite care, you can hire someone to lighten your load. When you take extended breaks, you don’t have to worry about your loved one being alone. Your elderly parent will have a qualified caregiver to tend to his or her needs. Watching your loved one’s health decrease could cause you to feel sad and depressed. Instead of living your life, you might isolate yourself in the house due to feelings of guilt. You need to continue enjoying your life. 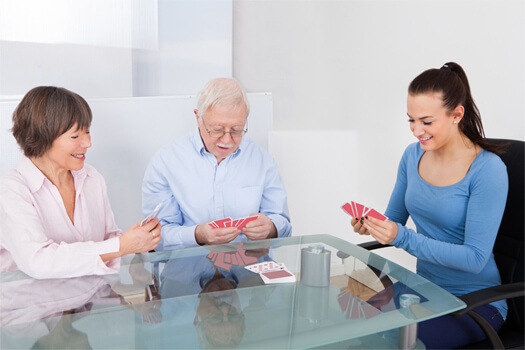 Respite care can give you peace of mind knowing your parent’s needs are being addressed while you are out having fun. In Richardson, respite care is a great help to many families. Caring for a senior loved one can be overwhelming at times, which puts family caregivers at risk for burnout. However, an in-home caregiver can take over your loved one’s care, allowing you the time you need to focus on your own health, maintain a full-time job, or care for other members of your family. Whether you need a respite or live-in caregiver for your elderly parent, call Home Care Assistance at (469) 573-4213 today.